I really wanna meet a dragon now. 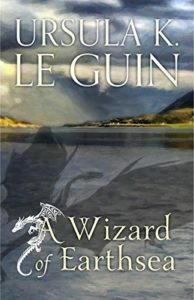 The earthsea quartet is four books that all follow Ged, known as Sparrowhawk, from his first feeble steps into magic, through his prideful youth, to a brave adulthood and then finally in his final years as Archmage of the wizard school on the island on Roke. 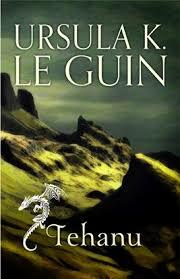 “But it is one thing to read about dragons and another to meet them. 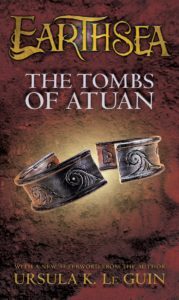 The second book, the tombs of Atuan, starts in a completely different place with a completely different character and slowly builds the world for us. Only in the crescendo of the book does Ged appear, not to save anyone, but to give them the courage to save themselves. In the third book, Ged is older and wiser. He sets out to save the world from something and he brings a young apprentice along. But the journey meanders, they do not know what they are fighting or where to find it, only that time and fate will bring them to it. Where in the first book Ged was an apprentice, and in the second book the two heroes were on equal footing, this book clearly shows us Ged coming into his own as a teacher and mentor. I read the books slowly, taking time to savour the language. Written in a distant language with remnants of verbal storytelling and poetry, these books flow so gently through the stories that one hardly deciphers the beginning and end of the plot. It’s fantasy unlike any fantasy I’ve ever read. Small intimate stories wrapped in poetical prose and the power of life and death. Nothing is ever solved by pomp, but always by one human carrying another. Share the post "I really wanna meet a dragon now." Between the Temeraire series and Heart Stone, I appear to be on a minor dragon kick this year so might need to get around to this (Wizard of Earthsea has been in my TBR pile forever).